Who are the Victoria Police? How can they help? When do I contact them? Melbourne is a safe city and there is no place for antisocial or illegal behaviour towards anyone. As in any large city crime can occur. Victoria Police was established in 1853, providing policing services to the Victorian community 24 hours a day, seven days a week, working to keep over 5.9 million Victorian residents safe. 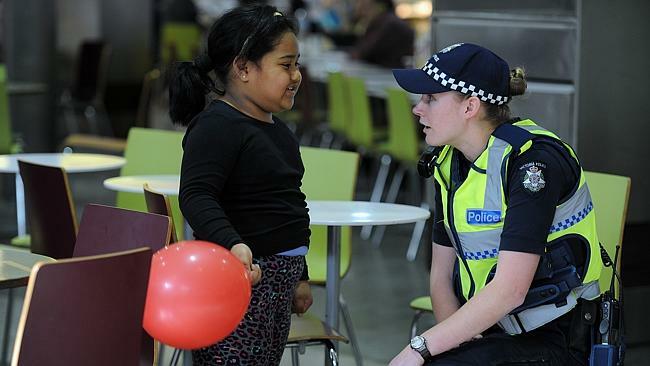 New police academy graduate constable Petia Grear on her first patrol at Sunshine Plaza. Photo supplied. When should I contact the police? Emergency assistance Please call Triple Zero (000) when an immediate response is required, to contact police while a crime is happening or if someone is in immediate danger. Read more about what to do in an emergency. Non-emergency crime incidents Contact your local police station via phone or in person to report non-emergency crime incidents, except for crime types detailed below. Find details of how to contact your local police on the Victoria Police website. You cannot report crime via the Victoria Police website. Reporting crime or hoon behaviour If you have any information regarding a crime, criminal activity, or hoon behaviour you can contact Crime Stoppers Victoria online. You can also 1800 333 000 and confidentially report what you know. Reporting cybercrime Common types of cybercrime include attacks on computer systems (hacking), online scams or fraud, identity theft, online stalking (including cyberbullying) and illegal or prohibited online content. The Australian Cybercrime Online Reporting Network (ACORN) is a secure reporting service for cybercrime incidents that may be in breach of Australian law. Certain reports will be directed to Australian law enforcement and government agencies for further investigation. If you are a victim of crime, go to your closest police station. The information you provide to police can often mean the difference between identifying an offender or not. Everyone has the right to feel safe in our community. If you are in danger or request urgent police assistance, call Triple Zero (‘000’) immediately. Alternatively, if you witness a crime, you can make an anonymous report to Crime Stoppers by calling 1800 333 000. If you are a victim of crime and report it to police, it will not impact on your current visa status. The Victoria Police website Safety Advice page has safety tips for what to do if you feel threatened and the best ways to protect yourself.